Wedding City Antalya can organize your traditional English wedding, Scottish wedding, Irish wedding, Belgian wedding, fin wedding, French wedding with pleasure. Wedding City Antalya is an international wedding operator in Turkey, Antalya. We are here to make your dreams come true. We are experienced on European wedding ceremonies and civil marriage ceremonies in Turkey, Antalya. Antalya is the pearl of the Mediterranean cost. Antalya, a beautiful city in Turkey, is the new trend for Indian Weddings. Wedding City Antalya can organize your wedding in Antalya in 5 star hotels. You can trust our company for your traditional Indian Weddings. Since 2015, Antalya and Istanbul began making Traditional Indian weddings. If you are planning a Destination Indian Wedding in Turkey, then you are at the right company who has all the knowledge and experience for Traditional Indian Weddings. There is an increase in interest to Turkey among Indian people for the last two years. Antalya is one of the most popular addresses of Indian weddings. Wedding City Antalya can organize your Mehndi Ceremony, Sangeet Ceremony, Haldi Ceremony, Baraat Ceremony, Varmala Ceremony and wedding reception in our luxury 5 star hotel partners. Antalya is a beautiful city. There are lots of places to visit in city center and surroundings. In city center most places can be visited on foot. After all the city center is generally around Ataturk Square and you can wander this area, old town area and yacht harbor area on foot. But of course not at the warmest hours. You can prefer after sunset. There is a panoramic elevator which can be used from Ataturk Square to yacht harbor. The important thing is how many days you will stay in Antalya and your preferences. It means if your preference is to see historical places, then you can organize a trip plan accordingly. If you prefer natural beauties of course you should make another plan. But if you want to make some shopping Antalya can also give options for that too. For entertainment, you can find lots of things to do in Antalya. You can read this article and then create your own trip plan also. In the morning you can go and visit Düden waterfall. You should go there with a vehicle because it is impossible to go on foot. Düden waterfall’s water ended last years because of the drought but with a system it was fixed. It is on the Alanya road. You can spend 2-3 hours around Düden waterfall. You can eat your lunch in a restaurant around and after lunch you can go to the old city and park your car and continue on foot. You can walk in old city Kaleiçi and yacht harbor. In the evening you can do a small yacht trip. When you return, you can spend the last hours of the day in yacht harbor and spend some time there. In the morning you can go to Kurşunlu waterfall which is on Alanya road. You should go with vehicle. Kurşunlu waterfall is more beautiful than Düden waterfall. You can have your lunch there and you can leave there like noon and go to Lara Beach. In Lara Beach you can swim in the beautiful see and finish the day here. You may find sunbeds, umbrellas and special gazebos with cushions. You can rent these things daily. Lara Beach is calmer and quieter than Konyaaltı Beaches. There are no entertainment activities in here. But there is a send sculpture museum in here which you should see. It may be interesting for you. The beach is sandy, the sea is clean. If you want a relaxation you can go to Lara Beach and if you prefer some entertainment you can go to Konyaaltı Beach. You can make a nice city trip on foot. Maybe you can try to eat bean salad with nut and garlic sauce in a restaurant in Kaleiçi. Because it is a traditional taste in Antalya. Moreover do not forget to buy jam especially fig jam from city center. You can also visit Ataturk Square, Yivli Mosque, Hadrian Door, Ataturk Park and Antalya Archeological Museum. Especially the Ataturk square has been designed and decorated very well last year. Vehicles can not enter and there are beautiful artificial flowers around. Ataturk Park which is along Konyaaltı beaches and Taurus Mountains is built in 1980s. This park is redesigned last year and become an incredible place with entertainment centers. There are lots of different venues in which you may find lots of different kinds of music. You may drink tea, coffee or alcoholic drinks and you can eat whatever you desire. You should pay if you park your car in parking area. If you consider going there, we suggest you to go in the evening. At the same day afternoon you can go to Migros which is located in the west side of the city. It is a very big shopping mall. You can not go to this shopping mall on foot, you should use either public transportation or your own vehicle. This shopping mall increases the tourism potential in Antalya. Migros shopping mall has been opened in 2001. Its parking area has 1300 car capacity. It has 3 different entrance, 8 cinema saloons and fast food areas. While you are eating your food there, you may see the beautiful Beydağları Mountains view. Right across the Migros there is an entertainment park. It is very attractive especially at nights. If you are interested you can visit. It is interesting especially for children. Furthermore, we can suggest Deepo shopping mall for the ones who are thinking to shop in Antalya. There is also another shopping mall next to Antalya Mall, it is impossible to go there on foot, you can reach there via vehicle. The last suggestion for the shopping lovers is Terracity which is next to Muratpaşa municipality. Terracity is built on 2011. It is possible to find every kind of product in there. It is good for especially tourists who are accommodating in Kundu Region. This shopping mall is also reachable only via vehicle. Moreover, if you are interested in history or museum, you should not forget the archeology museum in city center around Konyaaltı Beach region. You can go there on foot. You should definitely visit this beautiful museum. Wedding City Antalya is an international wedding operator. 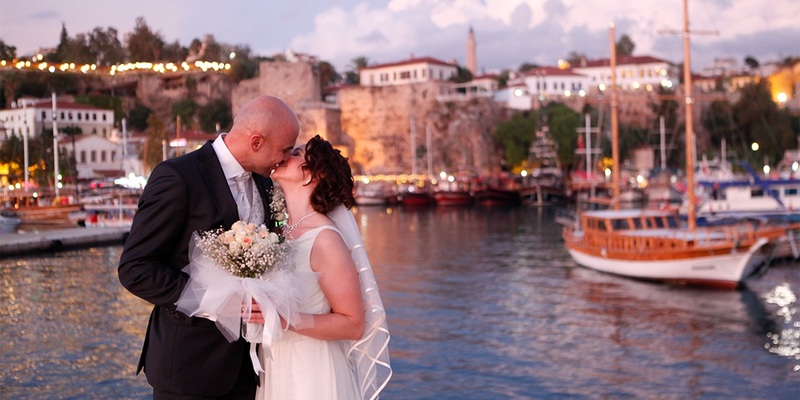 We organize destination weddings in Antalya. We prepare wedding packages for traditional Indian weddings, traditional Pakistani weddings, traditional Iranian weddings, civil British marriage. You may see our wedding packages from our web page. If you need any further information please contact us. Wedding City Antalya is an international wedding organization company and experienced on traditional Pakistani weddings. We can organize your Pakistani Wedding, Mehndi ceremony, Shaadi ceremony and walima ceremony. Please call us for further information about traditional Pakistani weddings.